And what of WOS, the station in the Missouri Capitol? That story is better known. Harry Snodgrass and the State Prison Band were not the only musicians on the air from that historic station in its earliest days. Charlie Walden has noted that the station aired a performance by three men who later became known as “The Old Tyme String Trio,” of Louie Barton, a fiddler from Jefferson City, bass player George Schrimpf, and guitar-player Noland Wrightman. Walden notes the group became the “house band.” for KOW for some time. He suggests legislators might have gone home and recruited other performers for the station’s Friday night fiddling contests. On December 31, 1925, the station held its first fiddlers contest, broadcast live. Walden says 82 people from 27 counties competed on a broadcast that lasted “well into the morning of New Year’s Day, 1926.” Listeners were encouraged to vote by sending letters, telegrams and postcards, and by making telephone calls to the station. More than 5,500 communications were received. Almost two weeks after the event, with the counting done, the announcement was made that Thomas Jasper Massie of Nevada had won. Other contests were held for other instrumentalists, too. For instance, Lee W. Hall of Warrensburg was named “State Champion Harmonicist” in January, 1928. The station always had a small permanent staff. The 1925-26 Official State Manual lists a new engineer, A. A. Murray, who had been a radio engineer in Kansas City, and a new announcer, C. C. Branaman, who had been a telegrapher in Green City before taking his job at WOS. 09:15 a.m. – News Bulletins and announcements of the day’s program. 10:00 a.m. – Grain market–livestock market–meat trades condition–market–Chicago and New York butter and egg market–stocks and bonds–weather. 11:00 a.m. – Grain market–livestock market–St. Louis live poultry market–St. Louis egg market–Chicago and New York egg market–Chicago spot butter market–stocks and bonds–weather. 12:00 p.m. – Grain market–livestock market–St. Louis lived poultry market–St. Louis egg market–stocks and bonds–weather. 01:00 p.m. – Closing grain market–police bulletins–stocks and bonds–weather. 02:00 p.m. – Livestock market close–estimated receipts for tomorrow–stocks and bonds–weather. 07:00 p.m. – Market review, a summary of the markets of the day, supplemented with the latest crop and market news. The manual reported, “These programs have not only been of interest to the WOS radio audience, but are helping to sell Missouri to both our home people and to the public at large. Listeners wanting to know the program schedule for the next month got it on the 20th of each preceding month on the front page of the Missouri Marketing Bulletin. “Sickness or other conditions or circumstances over which we have no control may make it necessary to make changes, but such is not often the case,” the Manual reported. But the author of the Manual’s article on WOS and the Marketing Bureau was just getting warmed up. The next state manual, for 1929-30, noted, “WOS is credited, by those who have investigated, as having been the best publicity factor that Missouri has ever had.” All of the farm organizations in the state–the Farmers Union, the Grange, the Missouri Farm Bureau, and the Missouri Farmers Association were welcome to use the station. And the marketing bureau reported, “Sundry Missouri colleges use this station from time to time.” Heiny remained as the announcer, at $50 a week. Farmington resident Fergus M. Sloan, a former radio transmission and construction engineer had become the WOS Chief engineer at the same salary. His assistant was Walter W. Wilson of Jefferson City, paid $150 a month. Remaining as the leased wire operator at WOS was E. W. Weigand, whose salary was split between the state and federal governments. He was paid $65 a month. It was not a fulltime station. Programs were often separated by dead air. Various educational, agricultural, and entertainment programs were broadcast at 8 p.m. on Monday, Wednesday, and Friday nights. The station was on the air from 9 to 5 each daily, and then back on the air at 7 p.m. (as needed) on Wednesday and Friday nights. WOS moved to the 630 position on the radio dial as it neared the end of its first decade. Control of the station passed from the agriculture department to the newly-created Missouri Highway Patrol on July 24, 1933 under a law passed by the legislature. The station already had been used since January for broadcasting regular and emergency bulletins for the Patrol. “Each patrol car is equipped with a radio set for the reception of these broadcasts,” reported the State Manual of 1933-34, “In addition to the time used on WOS, radio stations KFRU, at Columbia, and KGBX, at Springfield, have given the highest type of cooperation by broadcasting police bulletins on request. It was, of course, in the days before two-way radios in police cars. Troopers listened to their radios for messages telling them they needed to stop at the nearest telephone and call headquarters for information, or that they needed to go somewhere for an accident, a robber, or the like. Former Kansas City sound equipment operator Pemberton Gordon had become the station director, with engineering help from former St. Louis sales engineer Stuart Mahanay and former Jefferson City “radiotrician” Fred Wickham as the stations’ chief operator. Ex-taxi driver Otis Jones of Jefferson City was paid $15 a month as janitor. But the station’s days were numbered. State government underwent a reorganization in 1933 eliminated the State Board of Agriculture and its Marketing Bureau with the State Department of Agriculture. The station ws turned over to the Highway Patrol. Within two years, the patrol would have short wave radios for communication with troopers. The Federal Communications Commission had assigned the frequency of 1674 kilocycles to the Highway patrol, with the call letters of KTUK. The station would broadcast at 2,500 watts in the daytime and 1,000 watts at night. 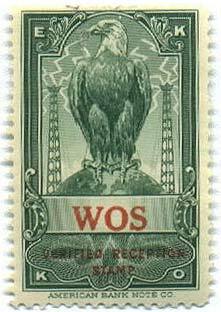 The role of WOS as a communications arm of the state, whether for agriculture or public safety ended on early in 1936, and the call letters were stricken from the FCC’s list of active stations on March 27. But Missouri’s Capital City was not to be without a radio station for very long. In 1937, a new station went on the air. Organizers of it were well aware of the heritage of the city’s first radio station. So they called the new station KWOS. They were used in the same way QSL cards are used today. More than 700 stations used the stamps to promote themselves and early radio. A listener was supposed to be able to hear the station’s call letters in order to receive a stamp. By the 1930s, the radio industry had changed so much that collecting EKKO stamps or the acknowledgement cards to which they were attached, was no longer of widespread interest.